Hiroshima City University (HCU) opened in April 1994 with the objective of becoming a higher education institution appropriate for an international city of peace and culture, which is the ideal of Hiroshima City. The University’s founding principle is to become an international university which contributes to world peace and to the prosperity of the community through education and research in science and art. 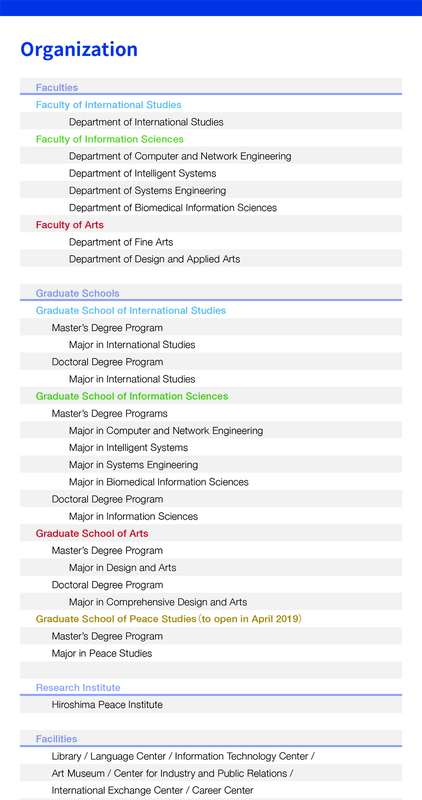 In addition to the three Faculties of International Studies, Information Sciences and Arts, with which the University commenced its history, three associated Graduate Schools were also opened in April 1998 in order to offer internationally acknowledged and advanced specialized education at the graduate level.To fulfill the principles laid out above, the University will open a Graduate School of Peace Studies in 2019 to offer professional level training in Peace Education and Peacebuilding. Each Faculty consists of several courses as indicated below. The University also has an affiliated research institute, Hiroshima Peace Institute, for the purpose of conducting academic research and passing on research outcomes to society, in order to step forward towards nuclear abolition and a global perpetual peace, which is the mission of the A-bombed city, Hiroshima. This academically advantaged environment and the unique combination of four areas of study – International Studies, Information Sciences, Arts and Peace Studies – are the attractive features of HCU. Copyright © 2019 HIROSHIMA CITY UNIVERSITY ALL RIGHTS RESERVED.